Agentul României la CIJ Bogdan Aurescu a declarat ă decizia Curţii în cazul procesului cu Ucraina acordă României 9700 de kilometri pătraţi de zonă economică exclusivă şi platou continental, reprezentând 79,34% din totalul suprafeţei în dispută. txtul sentinţei sunt redate mai jos (vezi harta cu punctele mai jos). 217. The Court observes that a maritime boundary delimiting the continental shelf and exclusive economic zones is not to be assimilated to a State boundary separating territories of States. The former defines the limits of maritime zones where under international law coastal States have certain sovereign rights for defined purposes. The latter defines the territorial limits of State sovereignty. Consequently, the Court considers that no confusion as to the nature of the maritime boundary delimiting the exclusive economic zone and the continental shelf arises and will thus employ this term. 218. 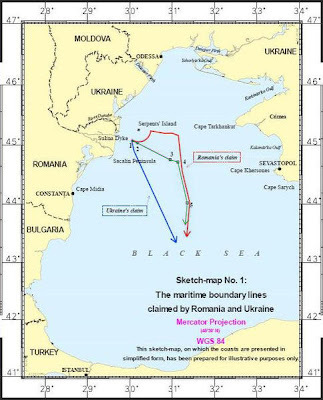 The line of the maritime boundary established by the Court begins at Point 1, the point of intersection of the outer limit of the territorial sea of Romania with the territorial sea of Ukraine around Serpents’ Island as stipulated in Article 1 of the 2003 State Border Régime Treaty (see paragraph 28 above). From Point 1 it follows the arc of the 12-nautical-mile territorial sea of Serpents’ Island until the arc intersects at Point 2, with co-ordinates 45° 03' 18.5" N and 30° 09' 24.6" E, with a line equidistant from the adjacent coasts of Romania and Ukraine, plotted by reference to base points located on the landward end of the Sulina dyke and the south-eastern tip of Tsyganka Island. The maritime boundary from Point 2 continues along the equidistance line5 in a south-easterly direction until Point 3, with co-ordinates 44° 46' 38.7" N and 30° 58' 37.3" E (Point A of the provisional equidistance line), where the equidistance line becomes affected by a base point located on the Sacalin Peninsula. Publicat de corneille la 2:26 p.m.
Cine răspunde pentru morţii crizei?